I am a fan of leftovers. In fact, many times I cook extra to finish up the vegetables that are about to die in my fridge or to use up ingredients that I bought more than needed because they were on sale (ahem, don’t tell me you never did that!!). And if you buy produce in places like Costco (their organic produce is fantastic by the way), I justify that the price is still a deal, even if you throw away the leftovers. Only, I cannot bring myself to throw away food, unless of course it ‘aged beyond recognition’. So when I make this quinoa dish, I always make a double batch. Not only to eat some now and save the rest for later, but also when I open a can of black beans, I’d rather use them all than storing in a tiny container which eventually gets pushed to the back of the refrigerator and finally forgotten. I recently made this for a Mexican themed gathering at our place and made more than needed to portion the extras into zip lock bags and gave away a few as ‘take home for later’ gifts to my guests and froze the remaining. And all I/they need to do is take out a bag and thaw for 20 minutes and heat it. Or if I am impatient I will rip off the zip lock back and nuke the thing in the microware for 3 minutes. Trust me Quinoa is very forgiving of such mistreatment and still rewards you with the same great taste. Wash quinoa thoroughly by rubbing between your fingers. This will help remove the saponins on the top layer of the grain, which otherwise makes it taste bitter. Rinse a couple of times. Cook quinoa with 1.5 times water (in this case 3 cups of water) and a pinch of salt (more salt can be added later). I prefer to go a bit lower with water than the usual 1:2 for quinoa:water ratio to keep the grains separate and fluffy. Once cooked, spread it on a tray to dry/cool lightly. If you are using a pressure cooker, electric rice cooker or Instant Pot, cook it the same way as you would cook rice. In the meantime, in a wide bottom pan on medium-high, add the oil, whites of green onions and red bell pepper and sauté for 2-3 minutes. Add cumin powder, salt, black beans and thawed corn and jalapeños if using (or red chili flakes). Toss to coat well. Add taco seasoning (if you add this early the starch in taco seasoning clumps up and sticks to your spatula). Finally add the slightly cooled off quinoa and toss to combine. If needed, add more taco seasoning or salt. Serve as a main dish or a side dish. Don’t forget the margaritas!! 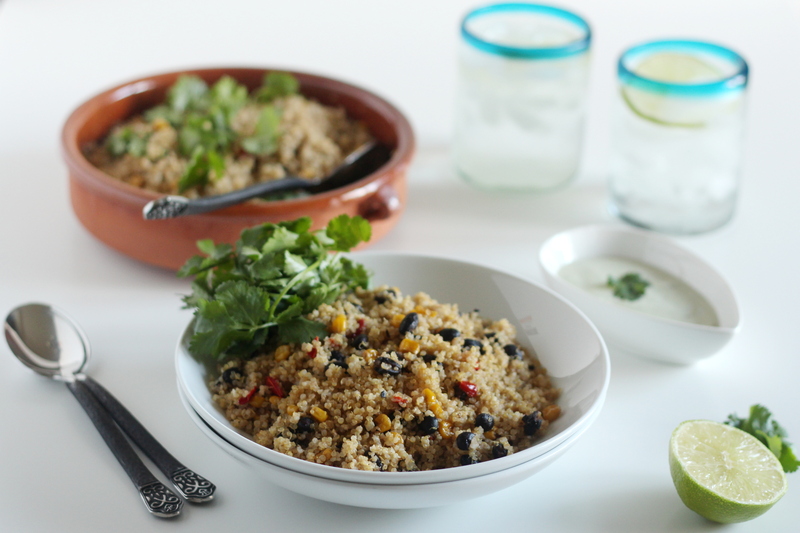 This entry was posted in Fusion, International, Recipes, Vegan, Vegetarian and tagged Fusion, Main course, Mexican, Quinoa, Side Dish, Southwestern, Vegan, Vegetarian, Whole Grains. Bookmark the permalink. This is an amazing recipe! Yesterday, I cooked a cup of quinoa and have been searching for creative, simple, and delicious ways to use it all up. 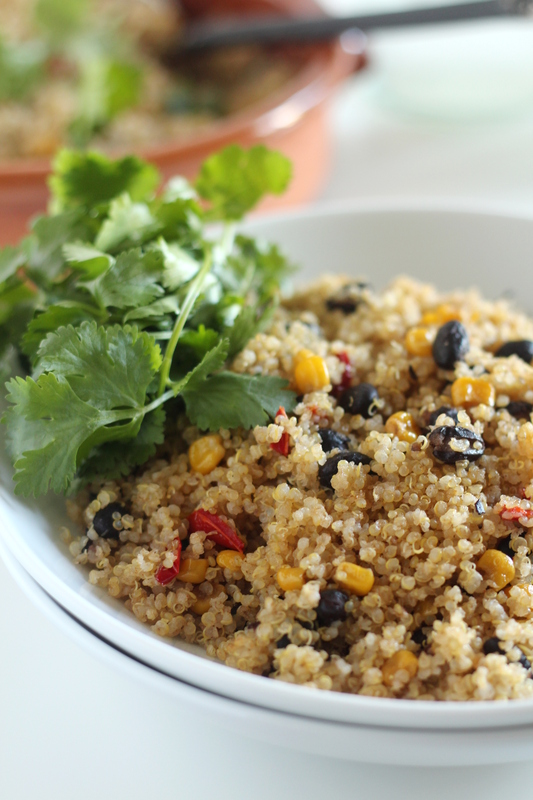 All of my readers know that quinoa is one of my favourite foods of all time – there are so many ways to eat it! I love it for breakfast, lunch, and even dinner. Thanks for sharing your recipe. I can’t wait to try it out! PS: I love your blog and your photography, and look forward to seeing more posts in the future!